PSA aims to be a leader in global ports and terminals business. It is our firm belief that business must not only be conducted according to the highest standards of economic efficiency but the highest ethical standards as well. These standards go beyond minimum legal requirements and reflect the Group’s long-term commitment to building a business that is successful, honest and responsible that all its employees can take pride in. 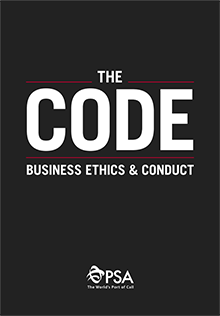 The Code reflects our business principles and offers guidance on what is expected of PSA employees in dealing with critical issues. We welcome your questions/comments and thoughts about our Company’s ethics and integrity. Your comments will be treated with the strictest confidence.